ABOVE: The main doorway into Harbor of Refuge Lighthouse goes through the caisson from the concrete collar into the "basement" of the structure. 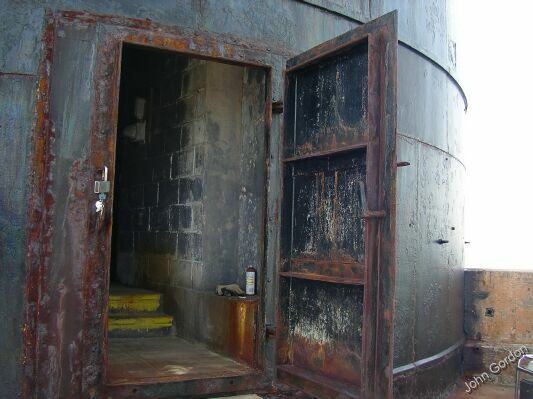 The door is fabricated of half inch iron plate and is hinged to a frame welded onto the metal "skin" of the lighthouse. The current door is of modern origin, probably installed sometime in the 1960s or 70s. It will be replaced with one of similar design to minimize the changes necessary to the structure. 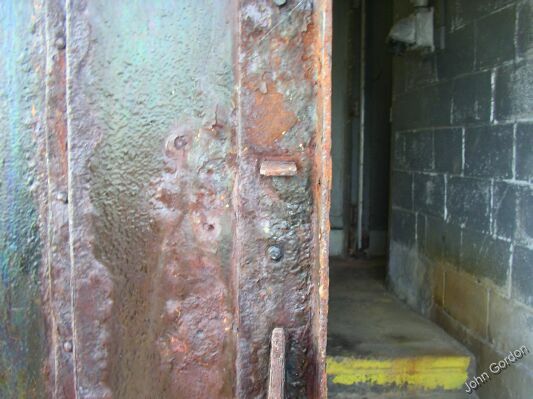 BELOW: Rusted hinges make opening and closing the heavy iron door difficult. 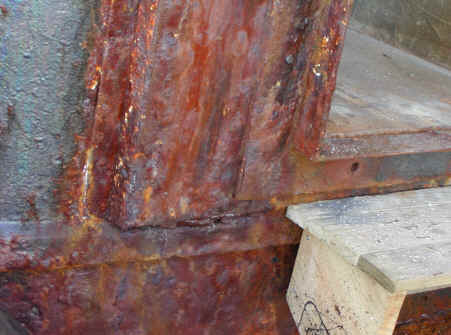 ABOVE: The door jamb is separating from the frame that's welded to the skin of the lighthouse caisson. Seams in the frame are separating and some spots on the door itself are rusted almost all the way through. 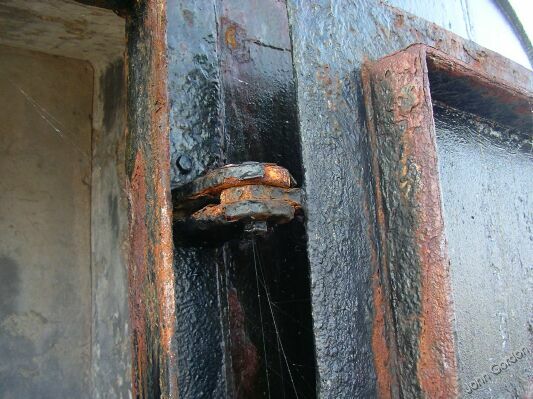 With just a quick preview of the condition of the main door at Harbor of Refuge Lighthouse in their most recent newsletter, members of the Delaware River & Bay Lighthouse Foundation have begun responding to the need for funds to replace the door. Over the Christmas holiday, the Foundation received the first donations, amounting to more than $1,500 -- a promising start to an effort that hopes to raise more than $12,000 to finance the door project. The door and frame are so rusted they're breaking apart! Hinges are so far gone it takes a strong man to open the door! The latch is in such bad shape we fear an easy break-in! Replacing the entire door and surrounding iron framework is now a TOP PRIORITY in order to insure the security and continued use of the lighthouse! The project is no easy task. It will require a custom fabricated iron door and frame, extensive on-site torch cutting for removal of the old frame and welding for installation of a new one, skilled metal workers and a work boat with a heavy duty crane. All donors to the Foundation’s Door Campaign will receive a handsome certificate featuring the Harbor of Refuge Lighthouse and an old time keeper coming through the original lighthouse door. The certificate will acknowledge the donor or whomever the donor designates to be honored. The person on the certificate will also be listed along with all other donors on the Foundation’s website www.delawarebaylights.org during the campaign and on a plaque inside the lighthouse once the project is completed. Donors will also receive an acknowledgement letter to document the contribution for tax purposes. The Foundation’s initial fundraising goal for the 2008 Door Campaign is $12,000. However, the total cost of the project may well exceed that amount when the cost of ship time is included. At this time, the Foundation is looking for qualified metal fabricators interested in undertaking the project and investigating options for obtaining a work boat. In addition to financial contributions, suggestions and in kind contributions of labor, materials, and work ship time would be most welcome. Contact the DRBLHF at P.O. Box 708, Lewes, DE 19958 or call the answering service at 302-644-7046.